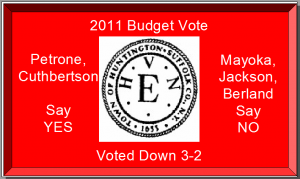 The Huntington Town Board voted 3-2 to not adopt the 2012 Preliminary Budget. 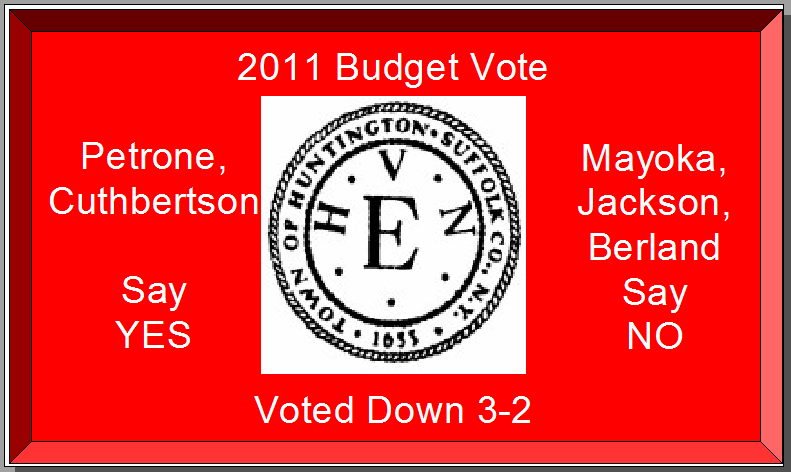 If a new budget is not accepted by Dec 20, 2011, newly re-elected Town Clerk Jo-Ann Raia informed the Town Board, the 2012 Preliminary Budget would automatically be put in force. There is only one more meeting scheduled for this year on December 13th. There could be a special meeting called if necessary. Susan Berland and Glenda Jackson stated that they voted against the budget because they were opposed to the deep cuts in the Arts programs. You may recall that a group of arts supporters attended a Town Board meeting to speak out against these cuts. They gave it quite an effort to save the program and it just may have worked. Mark Mayoka opposed the budget because he he feels it is not balanced and too dependent on the use of reserve funds. Frank Petrone and Mark Cuthbertson voted yes and were openly frustrated by it being voted down. Mark Cuthbertson referred to it as a “travesty”. We recently wrote articles about some things we found in the budget that we thought were questionable. We questioned the use of interfund transfers and the anticipated increase in mortgage tax revenue in this article. We had questioned the need for a needs analysis for HART Bus in this article.